NOTE: THIS PRODUCT IS NO LONGER BEING SOLD, SO THE REVIEW IS CLEARLY OUT OF DATE. CLICK HERE TO GO BACK TO THE HOME PAGE. This is a review of the mattress named “Honest Beds.” I almost titled this post “honest bed review,” but that almost sounds like “honest” is an adjective describing my review, rather than the name of the mattress. All of my mattress reviews are honest, but this one in particular is about the mattress available exclusively at Nest Bedding (which is a company I’ve done some other reviews for). This is yet another “mattress delivered in a box” product, but this mattress is quite a bit different from the rest you may have heard of. The Honest Beds mattress is a high end innerspring mattress very much in the “old-school” style of design. It’s an innerspring mattress, hand-tufted, and flippable. Two-sided flippable mattresses are very rare these days (which is one reason I say it’s an “old-school” design). In this article, I will look at the construction of the mattress, how it feels, the customer service policies, and who this mattress might be good for. The Honest Bed comes in two versions; a latex model and a memory foam model. Most of this review will be about the latex model, since that’s the one I recommend of the two. Both models use a “zoned innerspring” coil unit, in which there are two different types of individually pocketed coils with different gauges (thicknesses). The idea is that the mattress will support your body where it needs more support, and be a little softer where you need pressure relief. They are two-sided mattresses, meaning there is comfort foam on both sides. However, the sides are not identical, so this is not the traditional “flippable” mattress which is intended to be flipped often. Rather, the two-sided design gives you a choice of comfort. Once you find the side that’s best for you, you should keep it on that side. The latex version uses latex on both sides. There is a medium-firm side, and a firm side. The medium-firm side uses 3 inches of latex, the firm side uses 2 inches of latex. The memory foam uses 3″ of memory foam on both sides. It’s 4 pound density memory foam, which is durable. It also has a medium-firm side and a firm side. Neither model uses any high resiliency poly foam, which is a type of foam that many mattresses use on the bottom of the mattress. HR poly foam isn’t very comfortable, but it tends to be very durable, to hold the weight of the entire mattress. 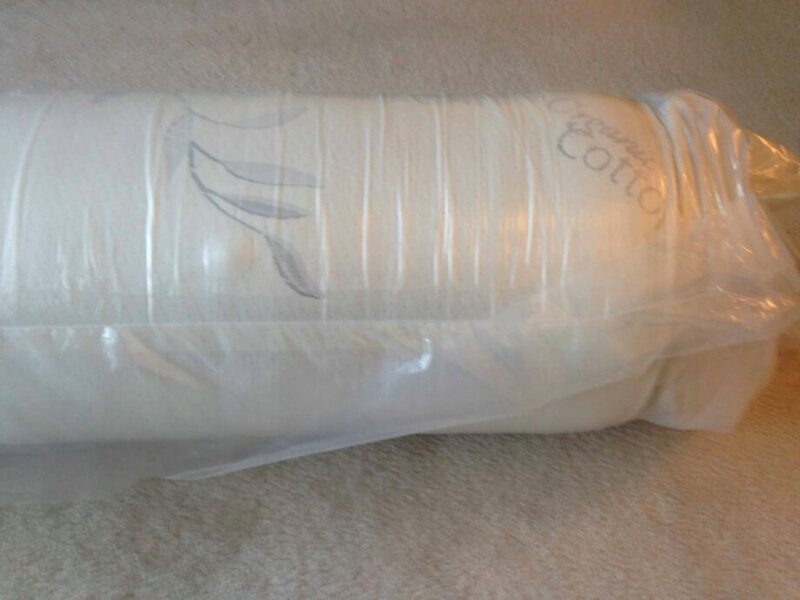 In the case of the latex mattress, this isn’t a big deal, since latex is an extremely durable material anyway. However, memory foam isn’t designed to be very supportive (it’s designed for pressure relief), and using that as the base of the mattress makes me a little nervous. I’ve been assured that it’s been tested and works fine, but I’m still a little skeptical about the memory foam version. For that reason, the rest of my review will deal mainly with the latex version. In both cases, it’s a well-crafted mattress. It uses handles on the side to make it easier to move and flip. The mattress is hand-tufted to keep all the layers together, it uses natural wool for the fire barrier, Oeko-Tex certified latex, and CertiPUR-US certified foams. The cotton in the “ticking” (aka the surface of the mattress) is organic. There’s very little to no scent when you first open the mattress from the box. This is the “before” picture. The mattress pops up to regular size almost instantly upon cutting the plastic. The latex Honest Bed is a fairly springy mattress, but since the coils are individually pocketed, the “bounce” is more up and down, rather than side to side, meaning you’re not going to disturb your partner too badly if you share the bed. It doesn’t separate motion as much as an all foam mattress would, but it does a pretty good job. I suspect the memory foam version would be a little less springy, but I didn’t try that one. The firm side is really firm, but it’s not the hardest thing I’ve ever tried. On a scale from 1 to 10, where 1 is the hardest, this is about a 2 or 2.5. The medium-firm side is a little more forgiving, but it isn’t really soft either. It’s roughly a 4 on the firmness scale. If you sit on the edge of the bed, there is one quirk to be aware of. Since the coil system is zoned, depending on exactly where you sit, the mattress will feel different. Where the thick gauge coil is, it will feel very firm, but if you sit where the softer coils are, you’ll sink into it further. The coil system is designed for lying down on rather than sitting. Because it is an innerspring mattress (and especially if you get the latex model), the mattress is unlikely to feel hot while you sleep. This is one of the most expensive direct-to-consumer mattresses on the market. It’s still a decent value, and compares favorably to other expensive mattresses you might find in stores (something like Kluft or Aireloom, for example); you have to pay for quality. The latex version is $100 more than the memory foam version, but the latex version is a better mattress and should last longer than the memory foam version, so I feel it’s well worth it. The latex mattress ranges from $1799 in a twin to $2499 in a king, but you can use coupon code HONEST100 to get $100 off. Like a lot of the other direct-to-consumer mattresses, the Honest Beds mattress has a 100 night in-home trial, meaning you’re not really risking anything by trying the mattress. If you don’t like the mattress, they will send somebody to pick it up and you get a full refund. Though I suspect that most people will find one of the two sides comfortable. That’s one of the benefits of having a two-sided mattress. The Honest Bed comes with a 20 year warranty against sags more than an inch deep. The “standard” warranty in the industry for an innerspring mattress is a 10 year warranty against sags 1.5 inches deep, so this mattress is built to last longer than average. This doesn’t necessarily mean it will stay the same comfort for 20 years, but it shouldn’t be physically falling apart. I’d expect the latex version to maintain its comfort for a bigger portion of that 20 year warranty than the memory foam version, because latex is a more durable material overall. There isn’t one mattress that’s good for the entire population, but this mattress will be good for a fair number of people because it is two-sided. Chances are, one of those two sides will work for you. However, it is quite expensive, so it might not be for you because of that. You’ve tried and disliked foam mattresses and really want an innerspring. In general, foam mattresses get higher customer satisfaction ratings than innerspring mattresses, but not everybody likes foam. You sleep hot at night. Between being an innerspring and using latex (which doesn’t get hot easily), this mattress will resist getting warm about as much as any mattress can. You can afford to spend $2000 on a mattress. This isn’t cheap. For others, there are better options, which I’ll explain below. While I believe the Honest Bed is a really well-made mattress and it should be very durable, I hesitate to recommend it for everybody because I feel most people will get a better night’s sleep on an all foam mattress like the Alexander Signature at a lower price. I preferred the Alexander to the Honest Bed personally, and because the Alexander is a foam mattress (and foam mattresses are generally rated better by customers), I believe most people will get a better night’s sleep at a lower price on that mattress. You can read my review of the Alexander here. That said, if you know you don’t like foam mattresses, and can afford the price, the Honest Bed is possibly the best innerspring “mattress in a box” mattress out there. Click here to buy an Honest Bed and enter coupon code HONEST100 for $100 off. I blog frequently and I seriously appreciate your information. This great article has truly peaked my interest. I will take a note of your website and keep checking for new details about once per week. I opted in for your Feed as well. I am really happy to read this website posts which carries lots of helpful information, thanks for providing such statistics. Wow that was strange. I just wrote an very long comment but after I clicked submit my comment didn't appear. Grrrr... well I'm not writing all that over again. Regardless, just wanted to say fantastic blog! Can I just say what a comfort to uncover somebody who really understands what they are talking about on the net. You certainly realize how to bring a problem to light and make it important. More people ought to read this and understand this side of your story. I can't believe you're not more popular because you most certainly possess the gift. Hi, I do think this is a great site. I stumbledupon it ;) I will return once again since I saved as a favorite it. Money and freedom is the best way to change, may you be rich and continue to help other people. I think the admin of this web page is in fact working hard in favor of his web site, as here every data is quality based material. When I originally left a comment I seem to have clicked the -Notify me when new comments are added- checkbox and from now on each time a comment is added I get four emails with the same comment. Is there an easy method you can remove me from that service? Thank you! Everything is very open with a really clear description of the issues. It was truly informative. Your site is very helpful. Thank you for sharing! I will immediately grasp your rss feed as I can't in finding your e-mail subscription link or e-newsletter service. Do you have any? Kindly permit me realize in order that I could subscribe. Thanks. What's up to every one, the contents present at this web page are in fact amazing for people knowledge, well, keep up the nice work fellows. Thank you for any other informative site. Where else may I am getting that kind of info written in such a perfect approach? I have a undertaking that I am just now working on, and I've been on the glance out for such info. I haven't slept on one of the "Cool Sleeper" foam mattresses, so I can't really speak to how hot it was. I tried it in New York City a few months ago, but since it was winter, the whole store was a little on the cool side. I'm not familiar with any "HBCS" mattress and a google search doesn't turn up anything, so I don't know what the differences would be.